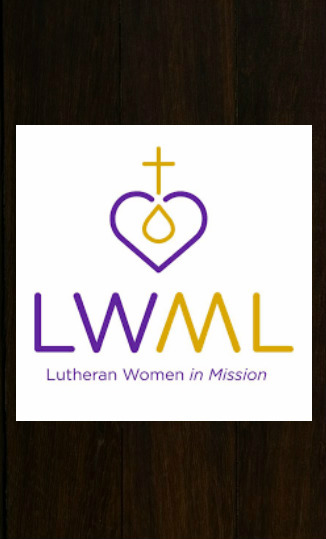 The Lutheran Women’s Missionary League (LWML) is Gloria Dei's official women’s auxiliary organization. It is a ministry of the Lutheran Church-Missouri Synod based in St. Louis and recently celebrated its 65th anniversary of serving our Lord and Savior. There are over 250,000 ACTIVE women who dedicate their talent and time to this organization. Mission Education: Women are alerted to opportunities and equipped to serve the Lord whenever and wherever He has need of us. Mission Service: Women help the needy through Servant Events, in their communities through the LWML and through their congregations. Mission Grants: Women support various mission grants in sharing the Gospel with others in our district, our nation, and around the word. THE MISSION STATEMENT: The mission of the Lutheran Women’s Missionary League is to assist each woman of the Lutheran Church-Missouri Synod in affirming her relationship with the Triune God so that she is enabled to use her gifts in ministry to the people of the world. National Conventions held biennially in odd numbered years, usually June or July.District Conventions held biennially in even numbered years, usually in the fall.District Retreats held in odd numbered years, usually in the fall. Zone Rallies usually held twice a year, in the spring and in the fall. MITE BOXES: LWML MISSION GRANTS are funded through volunteer contributions. Each supporter of the LWML places coins (mites) into an LWML MITE BOX AS A THANK OFFERING TO God and with a prayer for our world-wide missions. Contributions are collected locally and sent to the LWML FL/GA District. Monies are divided with 75% for the FL/GA District and 25% is sent in to be applied to the LWML national mission goals. Over $1,850,000 will be collected over the next two years through our loose change and mites for mission grants in the United States as well all over the world. Scholarship funds are also available to LCMS students who enter the Concordia educational system to become pastors, teachers, DECs, etc. GIFTS FROM THE HEART: At our events, we have an ingathering of various needs which a named recipient may need, and we refer to this ingathering of items as Gifts from the Heart. The host of each event selects their own charity, ministry or mission to be recognized and yes, there can be truckloads of gathered items. SERVANT EVENTS: Servant activities precede any convention or retreat wherein volunteers dedicate their time and talents to making a difference for others whether it be marking Scripture for prison ministry, making seed packets, making bird houses, or a host of activities to help spread God’s message of hope around the world. At Gloria Dei Lutheran Church, we strive to meet the national objectives. We have a group of ladies who serve on our board to plan and carry out various projects which would benefit not only Gloria Dei Lutheran Church but also our community at large. We meet on a "need to" basis. Interested in joining us? Call the church office and they will advise the Board of your interest. A Breakfast and Bible Study is held in the chapel the first and the third Saturday of each month, with breakfast 9:00am followed by the Bible Study at 9:30am. The studies vary, but are based on those found in the LWML Quarterly. We are usually out by 11:00-11:30. The breakfast is cared for by a team of two volunteers and a third volunteer does the Bible Study. You certainly are invited to join us simply by being there at 9:00am. You will indeed be glad that you did. An annual Christmas Brunch is held the first Saturday of December for all the ladies of the congregation. While the primary purpose of this gathering is to honor our Savior, we share in Christian fellowship and we support a local mission, ministry or charity with a Gift from the Heart offering or gift. In the past, we have sponsored Holiday Craft and White Elephant Sales, bake sales, hosted a Prayer, Praise and Potluck gathering. We collect soda pop tabs for the Ronald McDonald House, recycle ink jet cartridges. We have helped sponsor costs involving the GriefShare program at Gloria Dei, assisted the Lift High the Cross hot air balloon project, remembered our military people with a note of thanks. We provide PrayerNotes and CareNotes for our congregation, and of course we have named our Academy and Hope Pregnancy Center as recipients of our Gifts from the Heart activities. Our unit has also joined the Concordia, St. Louis Seminary Guild which assists our Seminary students and their families in various ways. In addition, we join in fellowship with other Lutheran Women in Mission at our Zone Rallies, District Conventions and Retreats as well as the International Convention held every other year. For more information, check out the national website www.lwml.org or call 1-800-252-5965. There are many resources available to you on this site and the LWML catalog for shopping as well. You can also link on to the FL/GA District website at www.flgalwml.com. Don’t have a computer? Then check out the PURPLE TABLE in the Fellowship Hallway. You will find an assortment of Mustard Seeds devotionals, Master Cards, the Quarterly as well as the current LWML catalog among some of the resources available for you to take and use. While you are at the PURPLE TABLE check out the display of CareNotes and PrayerNotes. Many topics of everyday living are covered in these four page pamphlets. Use them well and help spread the message of the Gospel to your family, friends and neighbors. God Bless each and every one of you. We hope that you will indeed "SERVE THE LORD WITH GLADNESS"!